With the alarming rise in gas prices, we understand, support, and encourage the ‘ride-share’ concept. From 2 to 20 passengers, our fleet of Luxury Limobuses can transport your private group together in total luxury. Leave your car at home, allow us to worry about the gas mileage and Vancouver’s crazy traffic while you and your group enjoy a private chartered experience that is not only more comfortable for you, but far better for our environment. Get on board with us and help maintain, as well as further enjoy, the beauty of our city! 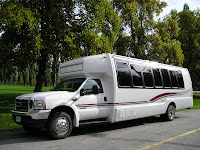 Visit http://www.luxbus.com/ for vehicle options and more information on our company and services.